Rawlings Conservatory Tour & Druid Hill Park trail clean-up. In this group, you will have the chance to speak with others who communicate and see the world like you do about the challenges that arise in neurodiverse relationships. Not only are coping strategies and tools presented, they are practiced in the meetings to help group members improve their relationship skills. Join us for an inspirational day filled with new perspectives and ideas. Learn from local and national presenters alongside parents, professionals and individuals with autism. Choose from a variety of autism-related breakout sessions and visit over 40 vendors and exhibitors for information and resources. The cost of this event is $50* per person. This includes a light breakfast, lunch and a cookie break. We have scholarship money available. If you need financial assistance please contact Heather Thoms Chesley at HADrequest@baltimoreautismsociety.org. You MUST register in advance for this conference. There will be no walk-in registration. Honestly Autism Day is presented by The Partnership Project-Autism Society of Baltimore-Chesapeake, Towson University & Baltimore County Public Schools. A networking and educational event to help families preserve a bright financial future for their loved ones with disabilities. Doors at 9 a.m., show at 9:30 a.m.
Game Night & Potluck Dinner! Please bring a game and dish to share. Please reserve your complimentary tickets on Eventbrite - ONE TICKET per group/family, please. Group leader Grace Myhill, MSW, focuses small group discussions on coping strategies for the unique issues that arise because of the neurological differences between each partner in a neurodiverse couple. The concert is FREE, but all concert attendees (including children) must reserve a ticket via Eventbrite. Please contact us at TheMusicalAutist@gmail.com with any additional questions. An open discussion support group for families. There is no cost, but reservations are on a first come basis, limited to the first 100 participants. Executive Functions: What's the Big Idea? Participants will examine how executive functions (EF), often referred to as the “hidden curriculum,” can impact a student’s success in the classroom. EF skills are a group of brain-based abilities that help students “execute” a task from start to finish and self-regulate one’s behavior. Similar to other academic and learning skills, some students may need varying levels of support and intervention. Strategies for teaching and reinforcing specific EF skills will be shared. Presented by Beth Lambert, SST/ 504 Facilitator, Baltimore County Public Schools. The Towson University Institute for Well-Being is continuing their parent education and networking series with an event for parents of children seeking information about advocacy. Join us for an informative panel presentation followed by questions and discussion. This event is an opportunity to expand and share your knowledge and connect with other families. Speakers: Carol Quirk from the Maryland Coalition for Inclusive Education & Jazmone Taylor from Parent’s Place. 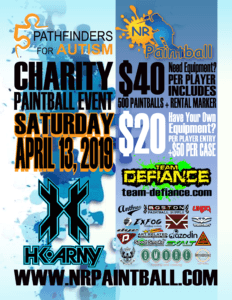 Charity Paintball Event Benefiting Pathfinders for Autism. This FREE biennial event features public and private resources for youth from birth to young adults of all abilities, and connects Harford County families to vital resources in our community. Families will benefit from information on summer camps, tutoring, mentoring programs, pre-school programs, services for children with disabilities and delays, behavioral health, college application support, finger printing, athletic programs, housing support, and financial support. A pre-transition workshop for parents of children ages 10-13 to get ready for the transition process. The transition from school to adulthood for children with disabilities and special healthcare needs can be challenging. This FREE two-day training, which includes the use of Lifecourse Tools, will help parents get ready to navigate this process and to develop a unique Transition Action Plan for and with their child. Join us for a free yoga class at the Yoga Center of Columbia! Benefits of yoga include reduced anxiety, increased body awareness and positive sense of self. Parents and siblings are welcome to join in. Please arrive 10 minutes early to sign-in. This program is made possible through the generosity of The Hussman Foundation. Dine out and donate at the same time! Dine at California Pizza Kitchen's Pizza With A Purpose event, and 20% of your check will be donated to Pathfinders for Autism! All you need to do follow the link below to print the flyer and present it to your server. This event includes dine-in, takeout and catering orders as well as all beverages. Executive Functions: What’s the Big Idea? HCAS is thrilled to co-host the Transition Journey, Parent to Parent meetings run by the HCPSS Family Support & Resource Center this year in our offices. These meetings are perfect for families who have a student with a disability preparing to age out of the school system and enter the world of adult services. The transition process is difficult to navigate, even for the most seasoned of families. Come out and enjoy informal conversation, meet other families whose students are transitioning to adulthood. Learn from each other as we navigate the process together. Callaway Brown- an unlikely young hero- has been stranded on a desert island, and it’s up to YOU to decide what happens next! In this interactive production, audience members vote on Callaway’s actions in an energetic romp through time and space. Will Callaway time travel to the Wild West and meet a talking horse? Develop superpowers and fight crime in the future? Or have a crush on a vampire? The choice is yours! Join us for the 5th Annual Health and Safety Fair for individuals with special needs, caregivers, parents, loves ones and community members. Enjoy a carnival atmosphere with games and activities for all ages, free food and snacks, and a comprehensive vendor resource fair. This event is fun for the whole family and, as always, it's FREE! Junie B. 's made it to First Grade and is having all sorts of adventures meeting new friends, becoming the boss of lunch, and creating a halftime show for the kickball game. This is a sensory friendly performance.